The Konnus Canal area, consisting of three canals of different ages and five sections of rapids, is located 6 km upstream from the parish village of Leppävirta. The historic rapids are a popular venue for fishing enthusiasts and hikers. Duckboards have been supplied to make getting around the area easier and there are jetties for fishing. 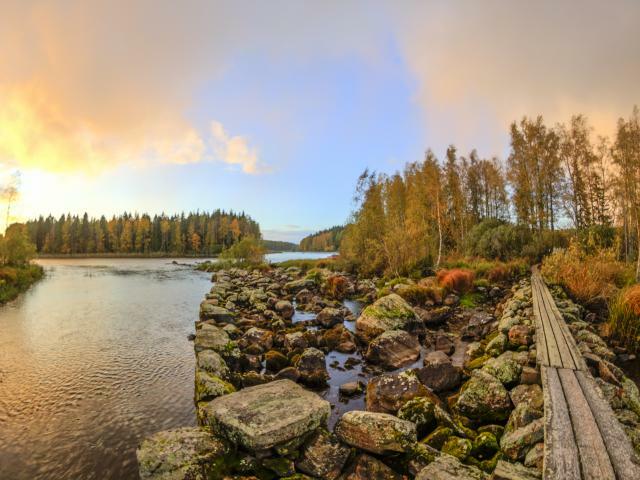 The canal area is one of the top spots in the Savo region for spinning and fly fishing. Natural trout, grayling and planted trout are just waiting to hit your bait. A charming forest lean-to with campfire facilities provides a cosy setting for grilling sausages or fish, or brewing traditional campfire coffee. The Konnustupa café also serves visitors of the canal area. The first of the three canals was completed in 1841. Once the Saimaa Canal, joining Finland and Russia, was finished in 1856, the Konnus Canal proved to be too small, and a new canal was built in the area. The construction work was partly motivated by the State’s need to provide work and a living for famine-stricken peasants, who were left with no means of survival following a series of crop failures. The new canal was opened to traffic in 1869. The oldest canal was converted to a log floating canal in 1917–1919, when its walls were lined with concrete. The third Konnus Canal was built in 1973, when the deep-water channel and the new Saimaa Canal were completed.